"Chicago! A city of jazz and gangsters, prohibition and poverty. 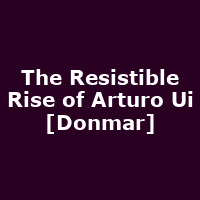 Amongst the murk of the Great Depression, there's room for a small time crook like Arturo Ui to make a name for himself. Brecht's satirical masterpiece about the rise of a demagogue will be given a new translation by Pulitzer, Olivier and Tony Award-winning American playwright, Bruce Norris. Lenny Henry makes his Donmar debut as Arturo Ui."